The Grand Budapest Hotel: A Review – My thoughts, precisely. I picked The Grand Budapest Hotel as the perfect outing for my mom’s birthday and it did more than just not disappoint. The story revolves around Mr. 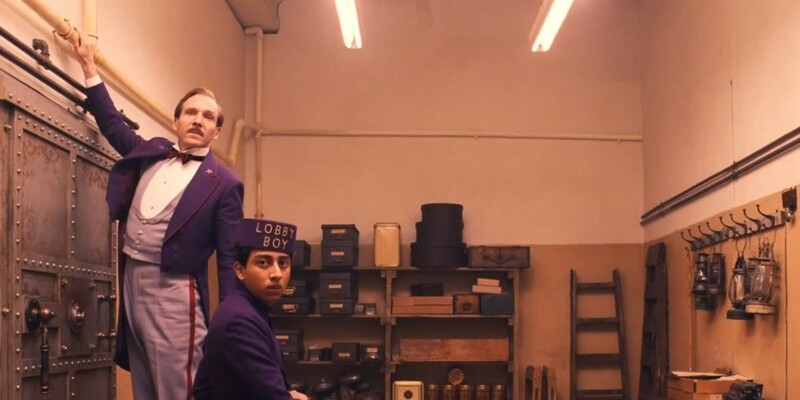 Zero Moustafa(F. Murray Abraham) reminiscing his life as a lobby boy(Tony Revolori) at the Grand Budapest Hotel in the fictional Republic of Zubrowka, under the legendary conciergeship of Gustave H(Ralph Fiennes), to a young writer(Jude Law) he happens to meet at the hotel. Young Zero’s recollections take us back to 1932 – a hard time between the first and second world wars, setting the events against the backdrop of a dramatically changing continent. This was when the Hotel was at the peak of its grandeur. The plot largely involves the battle for an enormous family fortune left behind by one of the Hotel’s regular guests, the wealthy Madame Céline Villeneuve Desgoffe-und-Taxis(a.k.a. Mme. D), and the theft of a priceless Renaissance painting, during all of which M. Gustave’s biggest concern is reciting well-timed poetic verses, seconded only by his fussing over the functioning of his beloved hotel. M. Gustave is portrayed as a people-pleaser; he is devoted to serving his guests to the best of his abilities – particularly needy old women. With his purple coat and tails, Ralph Fiennes does leave quite the impression, being the impeccable actor that he is. Zero is the obedient student and aid who goes on to become Gustave’s most trusted companion. He later meets and falls in love with Agatha(Saoirse Ronan), a local girl working as the baker’s assistant, who plays an important role in the unfolding of events. We are introduced to various other interesting characters in the story such as Dmitri(Adrien Brody), the deceased Mme. D’s opportunistic son; Jopling(Willem Dafoe), a merciless private eye appointed by Dmitri to make sure Gustave doesn’t get his mother’s fortune; Deputy Covacs(Jeff Goldblum) and his cat, who make a short yet important appearance. All in all, the cast is very well suited and makes the movie an intense yet comical experience. The Grand Budapest Hotel is one of those movies than entrances you with mere cinematography. The scenes are so symmetrical it is almost artistic; everything is perfectly placed in the geometrical center of the frame, from dead cats to grand hotels. The beautifully chosen colour palettes of the set, props and costumes are vibrant and profound, making it a treat to the visual senses. Everything from the doll house-like appearance of the old Hotel and its bright red elevator to the pretty pink pastry boxes that fill up the screen along with Zero and Agatha leads to an explosion of colour and also lends it a vintage character, making the movie ever so endearing. An adult rating seems most becoming of this movie due to a few disturbing scenes, including one of a severed head and another of several severed fingers; sexually explicit visual content and language are also rampant. This is not a movie for the young and impressionable. Verdict: An endearing comic drama that tends to leave one with a sad smile, this movie has gone down as one of my favourites. The screenplay is intense and compelling yet amusing, keeping the viewer engaged throughout. Brilliant acting, enchanting cinematography and a lovely background score make it a treat for the senses. A must watch! Tagged art, between wars, book adaptation, books, budapest, comedy, concierge, dvd, europe, hollywood, hotels, imdb, movie review, movies, murder, must see, must watch, mystery, ralph fiennes, recent movies, review, the grand budapest hotel, tv, war, world warBookmark the permalink.